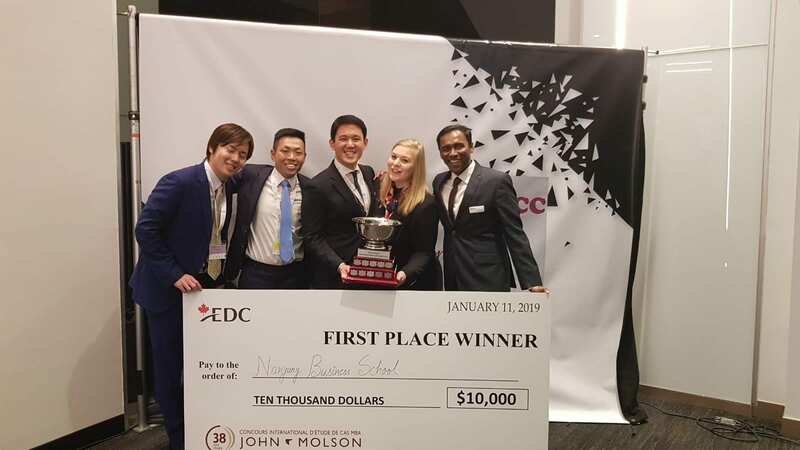 Reflections on the John Molson Case Competition by (L to R) Liao Minghao, Victor Han, Daniela Pillhofer and Vishnu Prasad. 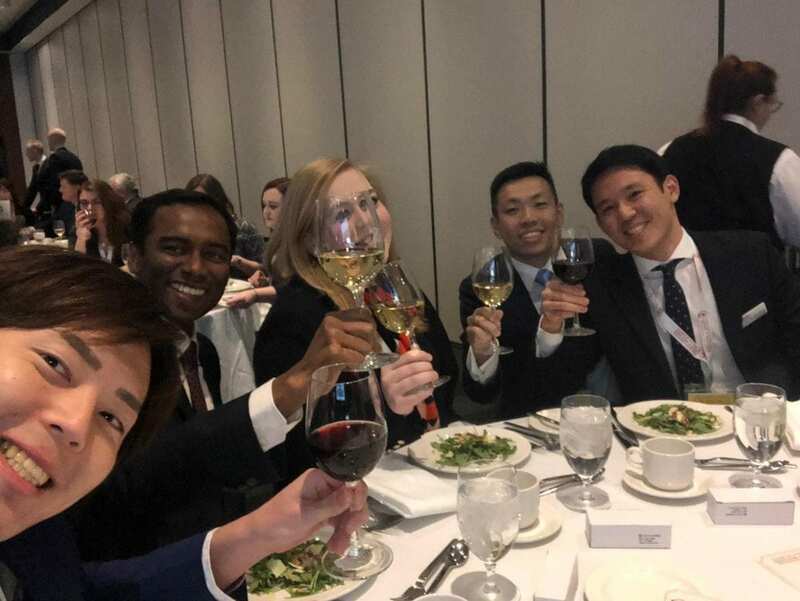 Nanyang MBA, Class of 2019. It started with Prof. Vijay Sethi’s sharing of the competition in class. We quickly realised that the opportunity to participate at the JM Case Competition would provide an occasion to test our skills in an intense environment, thus making it a great learning experience. For Minghao, for example, it was also tempting to test whether he could succeed in a business competition despite coming from a military background. We certainly loved a good challenge at a global scope and envisioned the competition as a platform to build on essential employment skills, such as thinking on one’s feet, presentation skills and case analysis – which is a must-have for a consulting career, which Victor envisions to take on. What was the competition like? How many rounds were there? What were you tasked to do? How much time did you have/spend preparing for the challenge? The competition comprised 36 teams representing Universities from 20 different countries. Teams were divided into 6 divisions with 6 teams each. In total, there were 5 pre-rounds after which the 6 division winners and the 3 best second-scorers across all divisions would proceed to the semi-finals. The 9 semi-finalists then competed for the 3 spots in the finals, thus making us solve 7 cases in total. In each round, we had to tackle a business case. In most rounds we had 3 hours to read, analyse and solve the case, including preparing our presentation. One round was a short-case, for which the time was reduced to 90 minutes. For the live case, which represented one of the week’s highlights, we had 120 minutes for preparation following 90 minutes of a company’s case presentation live on stage. Presentations lasted for 25 minutes. Judges, which consisted of a panel of 5 executives, then had 15 minutes for Q&A. Each round saw the team pitted against another team head-to-head. Our team was formed on 18 October 2018 and we spent a total of 40 hours in active practice, that is, we solved 8 cases together in Singapore before travelling to Montreal. 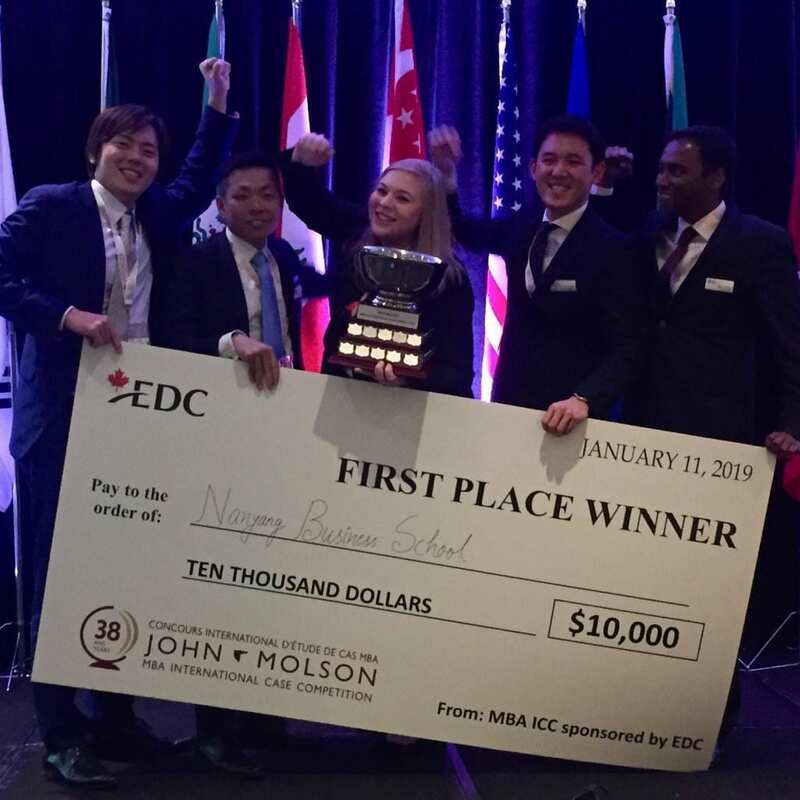 Understand that this competition is the oldest and toughest global case competition in the world, what were some of the challenges you faced during this competition? The time constraints were certainly a big challenge. Not only did we have limited time to familiarise ourselves with our respective work styles, but also did we have limited time to solve a case and prepare our recommendations. In this aspect team work was key and understanding everyone’s strengths but also weak points, was crucial. During our preparation time, we experimented with different team roles at first, but after the 3rd case, we agreed on defining every one’s roles clearly. As a team, we brainstormed and decided on the problems underlying the case and the solutions we would want to suggest. Yet, moving on from there, every single person had to take ownership in a specific direction. To exemplify, Daniela took the lead on the presentation and risk management; Minghao and Victor focused on our strategies’ implementation plan and Vishnu “owned” the financials. As we progressed to the semi-finals, fatigue set in and pushing through feelings of exhaustion posed a great challenge as well. Yet, we knew that we had to step up the game. We had to speed-up on our ideas generation, increase the amount of content we wanted to present, and come up with better stories that frame our presentation. Only due to maintaining vivid communication as a team and blindly understanding each other’s skills and boundaries, we managed to improve from case to case. Finally, our respective value propositions, which neatly complemented another, fully shined through. The sum is always greater than its parts. While all of us are from different backgrounds and nationalities, we understood that through transparent communication of one’s strengths and weaknesses, implicit barriers for cooperation can be overcome. We turned our challenging diversity into a strength – coming up with more ideas, opinions, working styles and stories. That said, diversity is key to success. Finally, it is very important to believe in oneself, irrespective of whether one already excels in a skill or one only starts making one’s first steps in a particular area. The right attitude can make a big difference. And importantly, nothing can beat a great story. We all love storytelling, don’t we? Did what you learnt during Nanyang MBA programme help in any way in this competition? Certainly, some frameworks taught in classes were essential to our success. But even more importantly, our leadership classes were crucial to turning us into a winning team. Before we started working together, we were already sensitive to differing working styles and cultures and thus, were mentally prepared to adapt and compromise. Also, managing time under tight deadlines, which is common in our MBA programme, was very helpful. And of course, it was beneficial that we are used to giving presentations due to the MBA curriculum we currently enjoy. 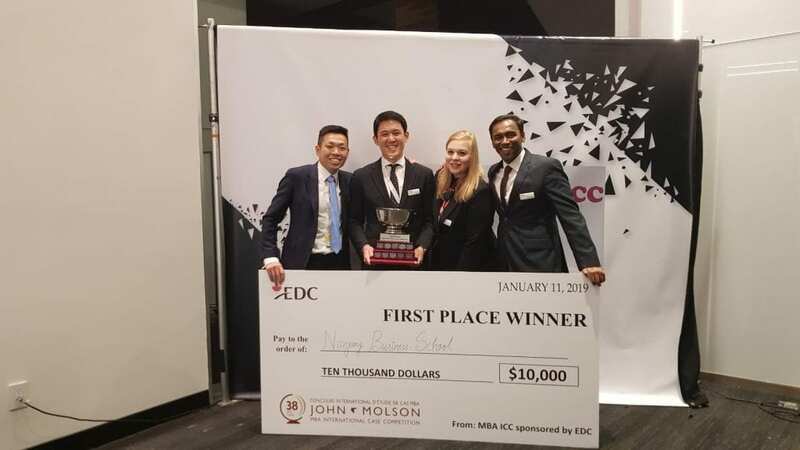 Finally, since the topic of “disruption” was guiding this year’s John Molson case competition, the learnings and insights from our Technology & E-business classes with Prof. Vijay Sethi proved being invaluable to encouraging us to think outside of the box. The John Molson case competition certainly is a once in a lifetime opportunity to test one’s skills on a global, very competitive stage. We were very impressed by the quality of teams there and having managed to take the victory home to Singapore, is a great boost for our confidence. That said, anyone willing to take part in this competition should know that is a very time-intensive commitment and one only gets as much out of it, as one is willing to put in. If you decide to take part, approach it with an open-mind and always be open to pivot your ideas, guided by your team. Prepare early and prepare consistently. Embrace this opportunity and give it your all. Bond with your team and understand how you tick during time pressure. You cannot plan out everything, but you need to be ready to plan for everything – on the spot. Above all, enjoy it and share the John Molson spirit! To find out more about the Nanyang MBA programme please visit our website.